I will be in St Louis in about 10 days time for the BiLT event. I'm doing a lab where I will walk people through the system I have developed for creating modular classical columns. By coincidence, my good friend Marcello (Mr Simply Complex) shared a Corinthian column the other day, so I decided to download it and take a look. It's a very nice demonstration of what can be done with conceptual massing, and ... it weighs in at under 12mb. That may seem quite a lot, but "Point World" is notorious for generating huge files, so in my book he did a great job. I have two different styles of leaf at present, and neither of them looks much like his, so I immediately thought "let's canibalise those." This took me on an interesting journey yesterday which I decided to share. The strategy is to isolate a single leaf, export to SAT, bring back into Revit, & scale to the size I need to be compatible with my system. But there is a snag. Revit 2017 changed the way that SAT imports are handled. This has advantages and disadvantages. I my case, mostly disadvantages: can't scale, can't find the CAD layers in "imports in families". The solution is to bring it into 2016, save it, then open in 2018. That way it gets treated as an old fashioned CAD object. Looking closely at Marcello's leaf, it's made from two surfaces. If it had been solid we could have exploded the SAT import in 2018 and applied a material parameter to the resulting "freeform" object. But you can't really make this kind of shape as a solid, I've tried. Each surface is created from a series of curved reference lines. You select the lines and "Create Form" The curve that defines the edge is shared be both surfaces so you get a seamless join, but at the tip and the base, the surface approximates a curve from the end points of the lines. As a result there are very small gaps. It's not a problem, you have to look very close to even see them, but it gives an interesting insight into how conceptual massing works. I also noticed some strange artifacts on one of the flutes of the column. No idea what causes this, and again it doesn't really matter, but it's worth knowing that Conceptual Massing is a bit quirky. So I went through the SAT to 2016 to 2018 process and created families for "Leaf-A" and "Leaf-B" These are the standard names I use to be able to swap out different styles of leaf while maintaining all the parameter settings that I use to control visibility for half-columns and corner-columns. The result is a third variation of the Corinthian Capital for my collection, and it weights in at just less than 1mb. There are some rather odd artefacts that seem to behave like quantum objects. As you rotate the view they pop into existence, disappear, then reappear somewhere else. Very odd, but let's press on. There are a square versions of my other two capitals, and it's very easy to swap the leaves out now I have the standardised families. But I do need a third leaf type: a corner version of Leaf-B. This means going back to the source geometry. For now I just did a very rough and ready fix by dissolving the geometry, deleting three of the reference lines, then remaking the surfaces. Two of these pieces, placed at right angles make the corner leaf. There are big open gaps at the corner, but from a distance it's fine. I'll do a better job one of these days. I went on to use the leaves with volutes from one of my Ionic capitals to create my first version of the Composite order. Progress indeed! I am characterising Marcello's leaves as "fleshy" and when you look around, you will see capitals that look a bit like this. Probably more common, however is the "feathery" leaf style. I have a simplified version of this at present, and decided to try to push this a bit further. It's just one solid extrusion cut by a void extrusion at right angles. I felt pretty good about the progress I had made in a few hours. So I decided to revisit the column that Paul Aubin submitted as a contribution to Project Soane. I know from talking to Paul that he was really trying to push Conceptual Massing to its limits. The result is a pretty hefty file size. I decided to target his scrolls which are more impressive than my highly abstracted versions, also slightly bigger, so that's another variation which does occur in reality. Same process of going to SAT to 2016 to 2018. Bring this into my existing scroll family, adjust the size and position as close as possible, then delete my earlier geometry and save. Once again the standard naming convention preserves visibility controls when loaded into any of my Corinthian capitals. Unfortunately the scrolls don't just drop into place seamlessly, so I had to go back to the original geometry again. Once more it was a quick fix to get things working, but I'm pretty happy with the results. Deleted a bit of foliage and extended the stem of a tendril downwards. I'll get around to some square versions later (this one and the composite) The great thing about a modular system is you can just keep on growing the collection and refining existing components as time permits. Before I finish I must recommend Paul's book "Renaissance Revit", an absolute treasure trove of advanced family editor techniques. Check him out on Lynda.com also. One of the best Revit/BIM educators out there. And of course there is Marcello. If you haven't seen him in action presenting a class, you are missing out, big time. Check him out on Twitter also, or his blog. If you are coming to St Louis, please come and say hello. If you are interested in contributing to the creation of an open source library of classical elements … even better. I have just uploaded my first post to the Volterra-Detroit Foundation Blog. You can find it here. There is quite a big overlap with my last two posts here, but also a slightly different take on the topic and a couple of new images. While I'm at it I may as well share my latest work with Autodesk sketchbook. This one was done on my phone and for some reason reminds me of the work of Modigliani. Difficult to say why, probably the stylisation and use of black. He came from Tuscany, was famously wild (even for an artist of the period) and specialised in female nudes. But this deals with layers receding into the distance: the hills in the distance echoing the tumbling rhythm of tiled roofs. Chimneys in Volterra seem to indicate wood stoves, a slightly different role from brick chimney breasts that feature so prominently in the traditional housing forms of Northern Europe. The tiled roofs are based on a two par system: flat pan with half round cappings. Both elements are tapered of course so that they can overlap in courses. It's a very ancient system. Greek Temples seem to have used a very similar arrangement. I modelled it quickly in Revit to gain a better understanding. In practice the system is much more subtle than that. You can use the half-round pieces "upside down" to tighten up the gauge, or reverse the pan to widen it. This allows local builders to cover irregular shapes and twisted surfaces. The slopes are usually quite shallow and the tiles are not nailed to the timbers below. It's common to see stones on the roof to hold end tiles in place during windy weather. 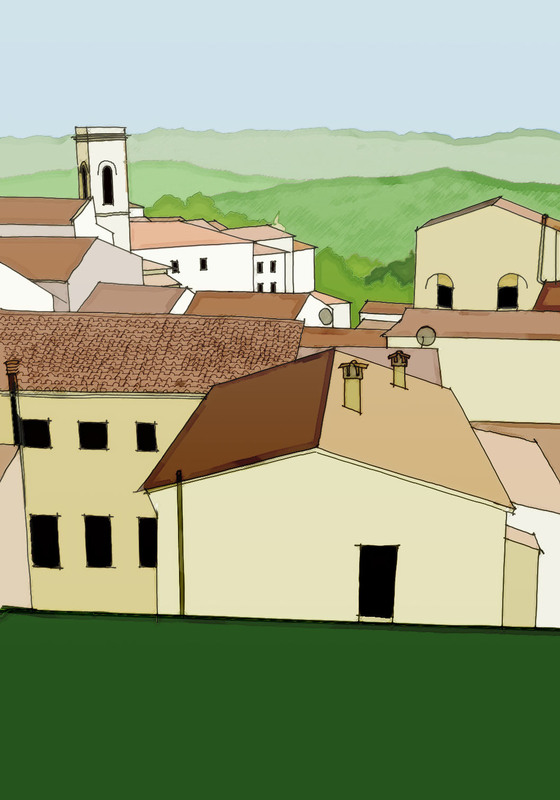 My next sketch captures the informality of one of the many shared domestic courtyards in Volterra. It's something of a study in diagonals and an abstract composition in colour and texture. At one level, the architecture here is a series of random accidents, an unthinking jumble. But somehow there is a romanticism, an unfailing sense of the picturesque. Is this just in the eye of the beholder? Why does exposed plumbing and dangling electric wiring sometimes seem to be an eyesore but in other contexts a picturesque frivolity? I want to close with another little Revit study of local construction techniques. It shows the use of thin flat bricks for ceiling vaults and for flooring, as well as for walls. The floors use closely spaced hardwood joists carrying two layers of bricks at 45 degrees to each other. This reconstruction is based partly on observation and partly on educated guesswork. I'm finding the combination of hand sketching and Revit modelling to be a very productive way of sifting through the data I collected in Italy. I'm calling it data, but I mean everything from personal memories to point clouds: lots of photos, screenshots from web research … the material is diverse and so are the methods for engaging with it.